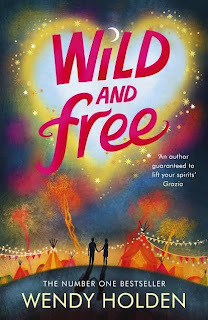 Book Drunk: Guest Post: Wendy Holden's Favourite Places in Yorkshire. Guest Post: Wendy Holden's Favourite Places in Yorkshire. 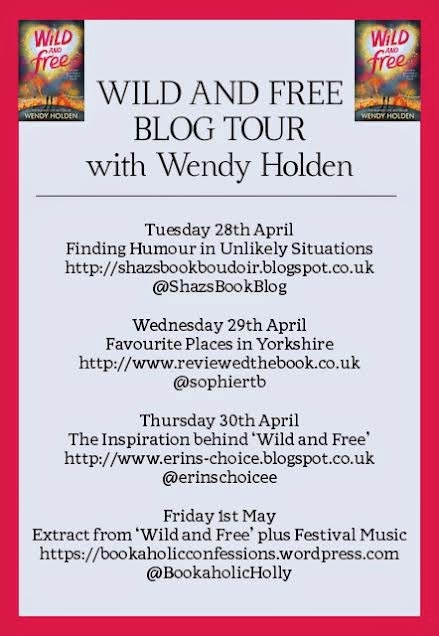 Wendy Holden is embarking on a blog tour to celebrate publication of her latest novel, Wild and Free, which was published last Thursday. I'm delighted that Wendy is joining me on Reviewed the Book today with a guest post on her favourite places in Yorkshire. Being from Yorkshire myself, I loved reading Wendy's post and I hope you all do too! I LOVE being a northerner. I live in Derbyshire, which is beautiful, but I was born in Yorkshire, which is of course God’s Own County. Whitby in North Yorkshire is one of my favourite places in the world, although the weather is less than predictable. Some of my happiest memories are of being happy-slapped by icy gales even in June. But who cares, if below me stretches the arc of Robin Hood’s Bay and beyond it the open sea? Who would want to be anywhere else? Whitby is famous mainly for its connections with Captain Cook and Dracula, although it doesn’t exactly cash in on either. One of the few bits of Dracula marketing is the B&B Bats & Broomsticks, an unassuming Edwardian semi featuring a life-size (undead-size?) cloaked figure, grey face just visible above the Nissan Micras of the guests. Apart from a distant clifftop statue with a seagull fixed permanently to its head, Captain Cook is similarly unobtrusive. But if you visit the small museum by the harbour, you begin to form a picture of just how extraordinary a man he was. The son of poor moorland farming folk, he had to plot his career path as carefully as he later plotted his voyages. He went to work in a grocer’s at Staithes specifically to meet the Whitby shipowner to whom he later became apprenticed, and whom he left to join the Navy, the rest being history. It’s striking that a man who found his own modest social position was no limit spent his career fixing positions on the surface of the globe. Whitby is the home of the original jet set – those who fashioned into elaborate jewellery and ornaments the shiny black stuff found in the local cliffs. The Whitby Museum has some wonderfully hideous examples, but its most hideous artefact of all is ‘The Hand of Glory’. This perfectly horrible glass-cased relic is believed to be the dried and pickled hand of a hanged man whose withered fingers held a candle made of another hanged man’s fat. When lit, it supposedly put everyone in a house to sleep so the place could be burgled at will. The museum also has some fossilized dinosaur sick and ‘The Truant’s Clog’, a heavy lump of wood with a chain and shackle attached. This early form of tagging was used by the truant officer on children skiving off school. The juveniles thus apprehended had to drag themselves to the headmaster, who had the key. My favourite item in the Whitby collection is ‘The Tempest Prognosticator’, possibly the world’s craziest and most complicated-looking barometer. Twelve large glass jars are arranged in a circle with a network of hammers and bells on top. The jars contained leeches which rose up and down according to atmospheric pressure and hit the hammers which set off the bells that warned of a forthcoming storm. It’s the British obsession with weather gone mad. In Scarborough, we always make the pilgrimage to The Harbour Bar, a harbourfront Fifties ice-cream parlour with a curved counter and ice-cream indulgences including knickerbocker glories, chocolate sundaes, Peach Melbas and Jelly Delights. Afterwards we go to Scarborough Castle, now a gale-beset ruin but once a royal stronghold through whose portals Piers Gaveston was dragged to a nasty end. Scarborough attracted plenty of celebrities in its day – just down from the gatehouse is the graveyard where Anne Brontë is buried (between two Holdens, as it happens). Inland from here is beautiful Castle Howard, which has some nice courtyard shops and that sort of Krypton Factor middle-youth playground on which parents as well as children romp about. Walking round the building’s outside once, I noticed that the famously lavish baroque detail included the Order of the Garter on the drainpipes. This astonishing example of unashamed one-upmanship made me wonder what insignia I would put on my own drainpipes to advertise my achievements in life. Our daughter’s Brownie badges are probably the best bet. In York’s Castle Museum I take the children to view the first thing I can ever remember seeing in my whole life. This is (weirdly, I know) the iron bed in the Condemned Cell of the Castle Museum. In the Minster, we inspect the grave of little Prince William, son of Edward III and kid brother of The Black Prince. His father and sibling fought at Crécy and his mother pleaded for the lives of the Burghers of Calais. Had he lived, the pressure would have been on. Yorkshire has the answers to everything – including who buys those enormous facsimile tapestries you see in English Heritage shops. In the one at Rievaulx Abbey, it turned out to be no less august a personage than Archbishop Sentamu. ‘He said it was for his windy Minster,’ the lady behind the desk explained.